If you are impatient, jump to the "Quick Start" and paste my setup into your ~/.emacs. That's all you need to do! So for this so-called "Goto Symbol" feature, Emacs wins. But in real world, regular expression is better, sometimes. As you can see, using regular expression to extract the string "MyController" is more versatile and simpler. My latest contribution to js2-mode solves this problem perfectly. It combines the powers of AST and regular expression. The js2-mode will integrate this feature soon. I will notify you when next version is ready. 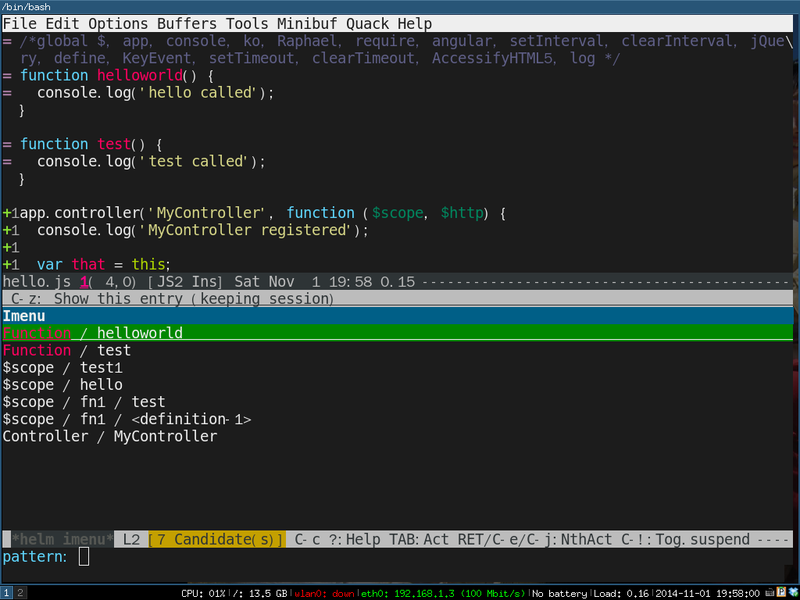 Please note Emacs displays two functions with the same name "test" correctly! BTW, my previous "Why Emacs is better" article got many feedbacks from Sublime users. One feedback is that my comparison is not fair because I'm comparing Emacs plugin with naked Sublime. Though I did some research before writing the article, I could be wrong. Please enlighten me if you know such Sublime plugins. 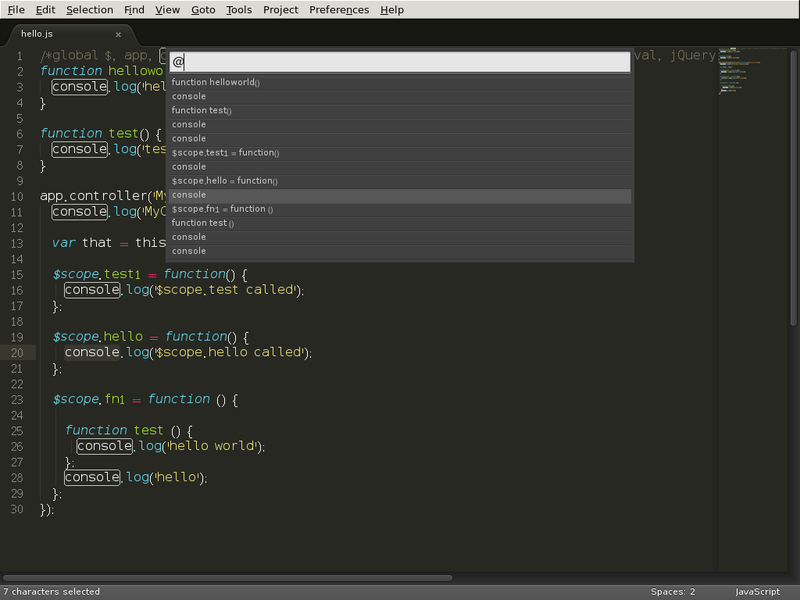 Another valuable feedback is that native Sublime provides better experience out of the box for junior developers. I admit that's a good point. But Emacs provides many awesome choices out of the box if junior guys start from setups of the masters (like Steven Purcell). Sublime users also argue that Sublime3 uses Python. Python is a better programming language. I'm qualified to answer this question because I wrote some large commercial Python application when I worked in Kodak R&D. First version I used was v2.2. So I've got about 10 years experience in Python. And I write lots of Emacs Lisp code these days. My opinion is that both languages are good enough as DSL for text editors. In Python, you can use OO. In Emacs Lisp, you can treat function as object and there are Macros and Advising. Both languages have enough widgets to shoot yourself in the foot. Python is surely newbie-friendly. But number of newbies doesn't matter in high-end rival. I'm still discussing with the js2-mode maintainer Dmitry Gutov about the best way to merge my patch. Dmitry Gutov updated the algorithm to parse the imenu items by walking the AST instead. It's better than my REGEX hacking because AST could show the context of the function. But my patch is still useful for extract strings from modern JS framework, as I've shown you in Angular example. I'm just updating my pull request to be compatible with the new AST walk algorithm. In the meantime, you can paste below code into your ~/.emacs before the patch is officially merged. "Recursively parse the original imenu items created by js2-mode. The line numbers of items will be extracted." "Try to detect does POS belong to some LINE"
"RLT contains imenu items created from AST. EXTRA-RLT contains items parsed with simple regex. Merge RLT and EXTRA-RLT, items in RLT has *higher* priority." ;; I only care about line number.